Come and practice the Triathlon race courses. We will have swim, transition, run clinics, and a BLUE course mountain bike ride. Visit our awesome sponsors and learn about what they have to offer. Demo bikes will be available as well as certified bike mechanics to check your ride. Get your body ready for the season! This event is FREE! • Early Bird pricing on Season passes, and more! The weekly triathlon series runs on Tuesday evenings at Winding Trails. 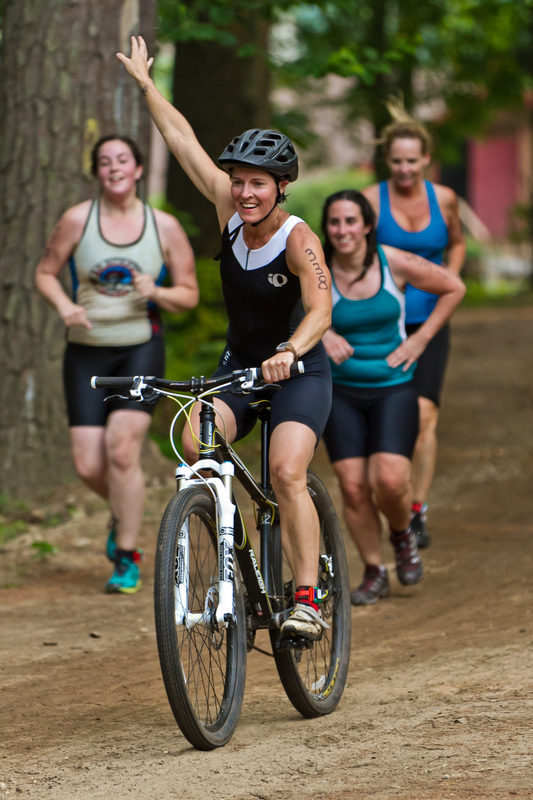 This year’s SPRINT distance series will again consist of a 1/4-mile swim in Dunning Lake, a 5-mile mountain bike ride (you must use a mountain bike ~ no hybrids), and a 3 mile trail-run through our beautiful woods. All ability levels are encouraged to come out and train in this friendly and fun environment. Our truly beginner Tri, consists of 1/8th mile swim, 3-mile ride (hybrids OK but mountain bike recommended) and a 1+ mile run. It is a great confidence booster for young and old alike. You CAN do this one and work up to the sprint distance. 5- to 7-year-olds: 25-yard swim, 1/2 mile bike and 1/2 mile run. 8 to 10-year olds:50-yard swim, 1-mile bike, 1/2 mile run. Swim is along the shore, where everyone can reach the bottom. Events are spectator friendly, only $5.00 a carload. Come cheer on your family and friends! Do all 3 races and earn a free t-shirt!